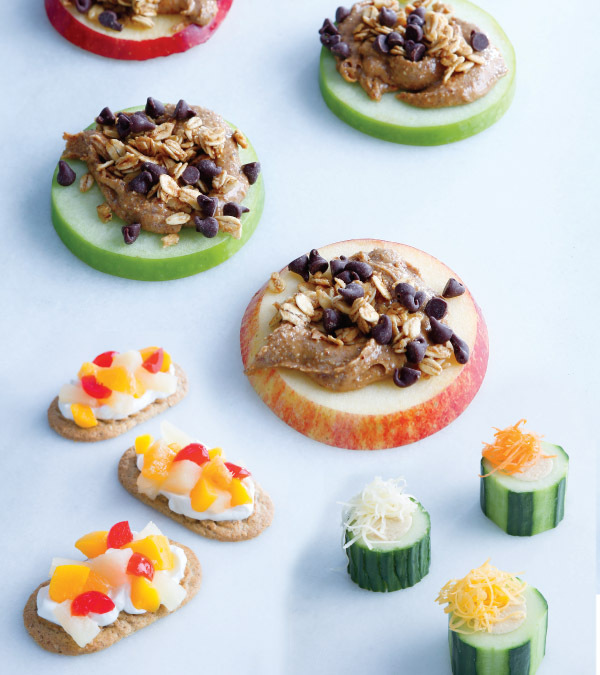 When busy schedules take over this fall, try these timesaving, healthy snacks! They’re simple to make, taste delicious and will delight picky palates. Be sure to have the kids help make them for an enjoyable after-school activity. Top breakfast biscuits with vanilla Greek yogurt and canned fruit in 100% juice. Slice a cucumber into 1-1/2-inch-thick pieces and scoop out the inside with a melon baller. Fill with hummus and top with shredded cheese or shredded carrots. Core and slice red and green apples horizontally. Top with almond or peanut butter, granola and mini dark or regular chocolate chips. Slit a banana vertically down the middle. Lay sticky side up and spread creamy almond or peanut butter over each side and top with sunflower seeds. Slice celery into 4-inch pieces. Fill with creamy almond or peanut butter and top with raisins. Mix vanilla Greek yogurt with blueberries. Fill an ice cube tray with the mixture and freeze for at least two hours. Layer whole grain tortilla chips (no salt added) with guacamole, salsa, shredded cheese, canned black beans (drained) and shredded lettuce.